01. 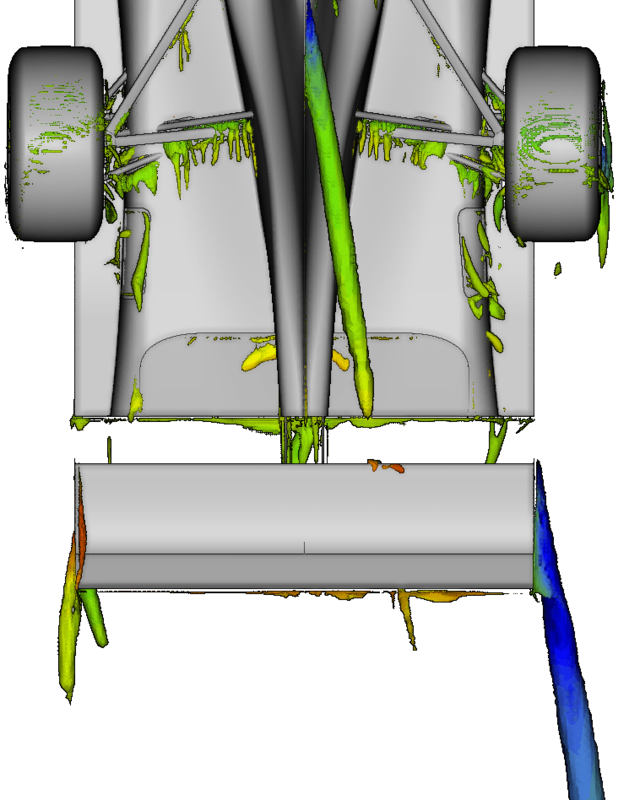 Don’t you just love the ability of CFD to “picture” what’s happening with airflow? I’ve only been playing with aerodynamics for about 40 years, CFD just over 25 years, and it still gets me going. 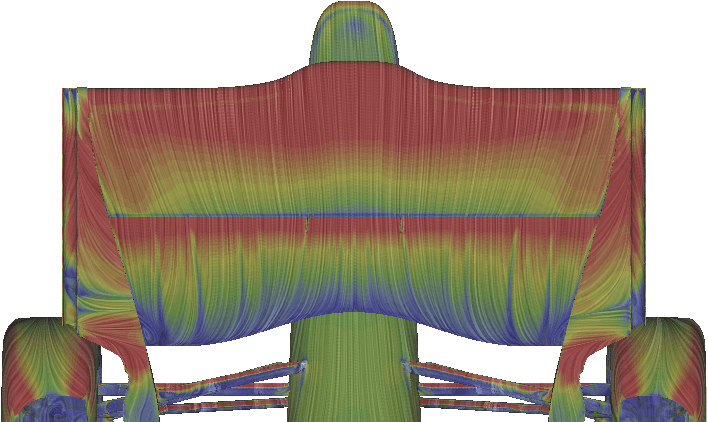 CFD images have often been called “Colours For Directors” – these ones are absolutely based on calculated airflow but are not particularly useful for developmental analysis – however, they make great images for showing some aspects of what’s happening with airflow. Add a verbal explanation and everyone should be able to understand what’s being show. Here I will give some indications about post-processing to those willing and able to set up CFD cases. This article focuses on analysing results. I am not able to share with you the lastest analysis techniques used in Sauber or indeed by top CFD experts, but I can give you some basic guidance about where to start. Advice on setting up cases can be found via CFD vendors and will differ depending on the code you choose. Before you delve into post-processing you will need to dig deeply enough into CFD to know how to split your model, set up domains, meshing strategies, turbulence models etc. However, I see so many people struggling with processing what they have already run in CFD research, that I thought I would start here. I use race cars as my subject, but the concepts discussed can be used with any sort of fluid dynamic simulation program. I’m not showing everything here, but things I know to be in the public domain (if you know where to look). 02. 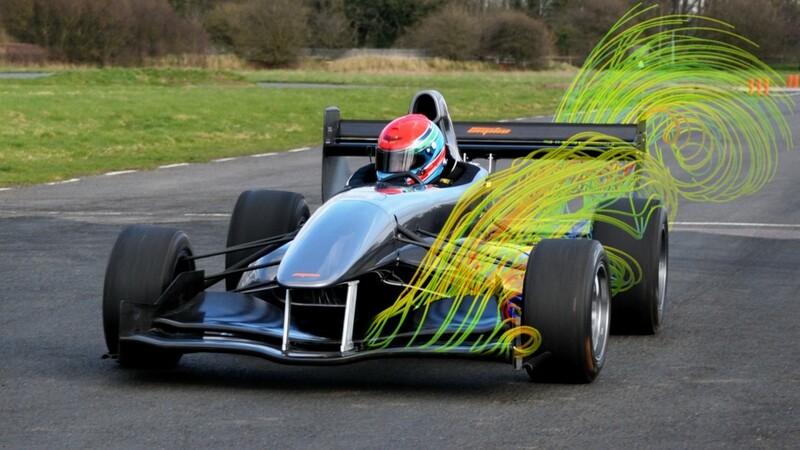 Simon Fidoe shaking down his Empire Wraith Hillclimb car at Curborough in March 2014 – streamlines coloured by velocity magnitude superimposed by TotalSim. I am a strong believer in CFD. I think it is the most cost-effective way of developing complex aerodynamic devices. If, that is, it’s done well using trusted methods and, with enough high-quality cells in the mesh, a good turbulence model. This requires specialist knowledge or very good advice. My friend Riccardo Pagliarella correctly pointed out that “CFD can allow interrogation of flow phenomena not easily visualised by experimental means”. In F1 these days each team has a group of people dedicated to correlating research methods to reality – so F1 teams generally have a pretty good understanding of the strengths and limitations of the CFD tools they use. From what I’ve seen, even some university student teams (F-SAE, Formula Student) have a very good handle on this so I felt it was time to share my thoughts about the analysis of CFD results. If you go to the trouble of doing CFD, then it would be silly to ignore a case just because the numbers are a bit worse than the last case or something has changed that you did not want / expect. Spending some real time on the analysis of the results and understanding what the flow is doing, try to understand the flow mechanisms at play. Solving CFD cases is done by a process of computational iteration and the convergence history will already tell you a lot. If convergence is erratic (in F1 we’re always pushing the boundaries) then you have unstable flow somewhere or a CFD setup-related problem. Pay attention to that or you will be creating a problem for your beloved new aerodynamic object. Real-world conditions often involve changes that will push flow far from the ideal of a single CFD attitude, so instabilities should be avoided. If instability in a RANS case seems cyclic, and you want to understand why/where (you should always want to understand! ), then you can use this cyclic (unsteady) behaviour to understand more. A good trick is to run the calculation on to an expected “high” point, conduct full post-processing, run on to a predicted “low” point and repeat full post-processing. Comparing the two sets of post-processing can tell you about the area of sensitivity. 03. Example of a convergence history that is far from ideal. The resulting airflow should be investigated for potential instability. Thanks to TotalSim. Convergence characteristics can be linked to physical aero phenomena. It is also possible to record the standard deviation of the pressure (fluctuation) acting on the surfaces of the body you are researching. Small variations for RANS and bigger (more realistic) using DES. 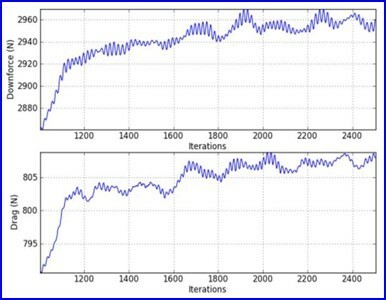 In time, you will learn much more from this simple looking series of plots (which can include the convergence history for sub-components). For example, if one sub-component in your vehicle shows big oscillation then the airflow nearby or the shape of that component probably needs attention. 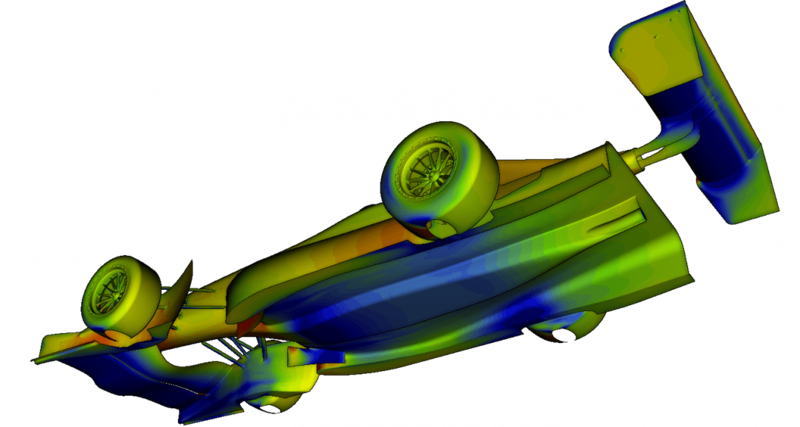 My friend Torbjörn Larsson at Creo Dynamics (he’s an ex-head of CFD at Sauber and Ferrari) commented: “Regarding convergence history, looking at force convergence as you describe is of course very sensible. I´d also say, don´t forget to check the flow residuals. I´ve experienced cases that show very nice and (expected) behaviour in terms of force convergence but for some reason exhibit a different characteristic while looking at flow residuals. If one case converges well in terms of forces but struggles to converge in flow residuals something may be odd. This could be related to the “beauty of” RANS (e.g. avoid symmetry conditions, ½ cars are typically not a good idea albeit very tempting to run to save cells. )” For projects where I paid out of my own pocket or managed the project myself, half-car symmetry cases were few and far between. Post-processing should certainly include a breakdown of the forces on the vehicle and many sub-components as well as many ‘standard’ images. It’s perfectly possible to pull the solution into the memory of a very powerful computer and to look at the flow in lots of ways manually. Old-fashioned CFD experts used to do this (manually). It is a great way to learn. However, if you want to compare a lot of cases then this isn’t a good long-term strategy. I suggest agreeing a list of standard images. Sticking to a set of a standard set of post-processing information and images will make it easier to compare cases in the future. It is also more time efficient – despite the time it will take initially. So what numerical data do you need? I ask for things like the case setup summary, including simulation speed, front and rear ride heights, yaw, roll and steer angles. 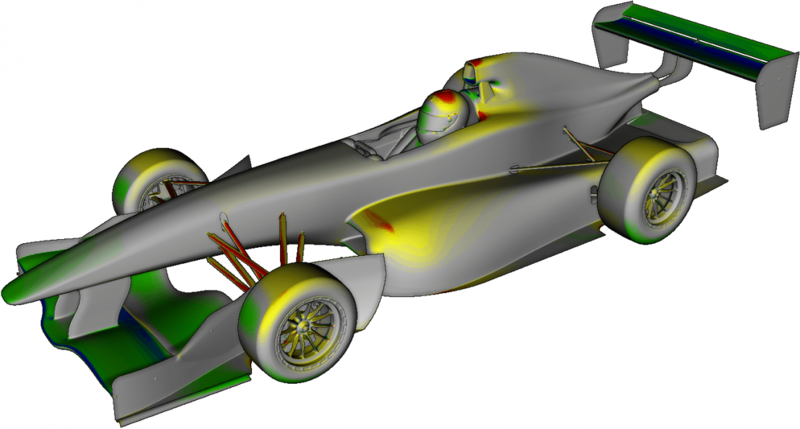 Then, overall downforce, side force, drag, force distribution, and a breakdown of drag and downforce on lots of components. Also important can be things like radiator and brake cooling flows, pressure of the air heading for the engine intake etc. The forces should be averaged over a pre-determined number of final iterations to smooth out fluctuations seen during the final stages of convergence. 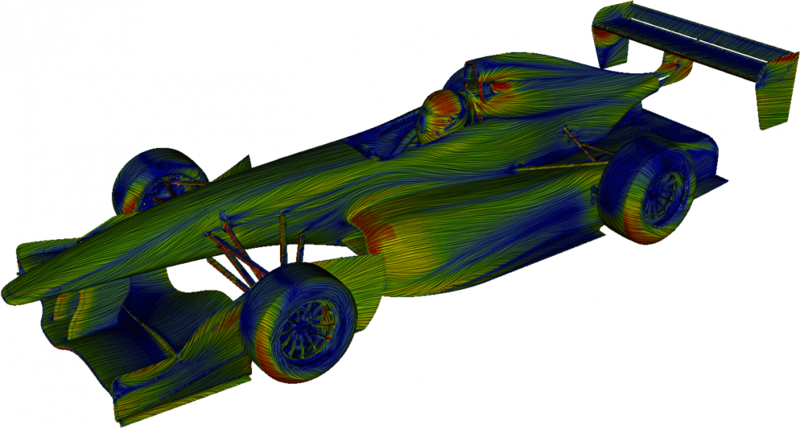 When you first learn to use CFD for aerodynamic development or understanding, it is correct that you create some bespoke post-processing images. There are many packages available and I cannot tell you which is best. I am a strong believer in open-source packages and several F1 teams use these. They are not as easy to use sometimes as commercial codes but there is no monster fee to pay. For any group of people or even an individual doing development work, the benefits of doing the same analysis on each case you run are large. So, I suggest you automate your post-processing as much as you can. Write a script to extract the same information and images from every case you run. For some of the more minor private fun (home) projects I’ve done, this means well over 1000 images per case. In F1 this means more than 10,000 images. I only go for high-quality images. Today this means 4k and above, in the past it was a bit less. Disks are low cost compared to your time – so store the images. The creation of standard post-pro takes time. A great little project for someone. If you are with a university Formula Student / SAE team, then this can be a specific task for a student interested in coding and in using it for a useful purpose. Once done, every person trying to do CFD has a head start and is able to start thinking like an aerodynamicist. What’s the best reference for calculating forces? An aircraft flying in free stream will react to forces and moments about its nominal centre of gravity position. Forces may react on a car at any height, but they are ultimately reacted through the contact patches on the ground. Images 05a and 05b – the impact of the centre of pressure of drag and side force on the calculated value for front to rear centre of pressure. Resolving about the contact patches, normal (downforce) and parallel (drag, side force) to the ground, simplifies your understanding of where forces are acting. That is the appropriate way to calculate aerodynamic balance for a ground vehicle. So, what are the most useful images? While I can’t show you everything, here are a few of the image types that I’ve found to be the most useful. Images of your vehicle or object external shape viewed in different orientations is a good starting point. The more (consistent, representative) orientations you pick the more comparative analysis you can do, within reason. 08. Here is the style of and number of object orientations that I would consider to be a minimum. Images are of a GT-type car but the type of object does not matter, thinking about what you may want to see and being consistent are what matter. 10. Surface (static) pressure plots (Cp) looking at the car from lots of different angles including front, rear and underside are really useful for looking at where and how hard the air is pushing and pulling on the car. NOTE the colours either side of zero coefficient of pressure – they are important and may not be obvious. Coefficients are used to normalise the plots so that you can compare cases calculated at different speeds. 12. On the CpX plot, red and yellow areas are where drag is being created, while areas coloured blue and green create thrust. The neutral colour around the zero coefficient really help to work out where the drag is created on the vehicle. 14. On the CpZ plot, red and yellow areas are where lift is created, and blue and green areas are where downforce is created. Grey areas indicate where there is not much happening (pressure close to atmospheric) for the particular parameter being displayed. Quite a few experts prefer this way of showing the forces acting on a car. I like to show a ‘dead band’ in a neutral colour, such as the grey in these images, that then allows the areas making the biggest direct contribution to drag or downforce (or any other parameter) to be highlighted. 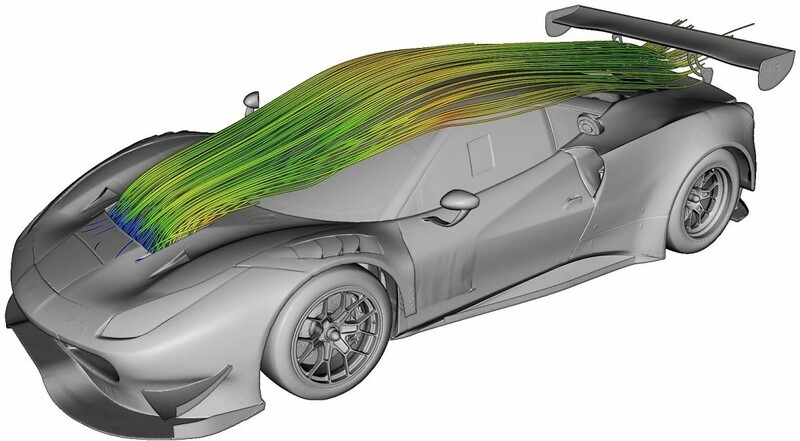 Regrettably, aerodynamics is extremely interactive so you can’t simply remove the parts that are high drag and expect the remainder of the flow to stay the same. That would be just too easy! By the way, there is no limit to the parameters you choose or the scale you wish to show. For example, you could show a front overturning moment and colour to that (have done that in the past). Any important parameter you want to visualise could be plotted in this way. These are images of the Empire Wraith hillclimb car. Images courtesy of TotalSim. Make sure you consider your colour scale. Keep your first few cases and use these to refine your processes including the colour scale. The grey scale can be anywhere in the range – or you can leave it out altogether. The colour steps can be fairly coarse, so you can pick specific transitions of the parameter you’re studying, or they can be fine (which personally, I prefer). 16. This image of the underside of the Wraith does not have enough colour range to allow you to really dig into the details of the pressure distribution (big chunks of area with the deep blue). Once you set your range, if you change, direct comparison with other cases is more challenging… Think about this early on in a project. Truth is with this car that the car reset the bar in its class and caught us out with the colour scales. 18. CpT-Wall is total pressure (energy is another description) near the visible surfaces of the vehicle. Red represents high CpT and blue low CpT. Normalised UW – blue to dark green with this colour scale means the air is moving slowly, while yellow to red means the air is moving quickly. The value 1 means air is travelling at free-stream velocity. 19 & 20. Normalised UW (basically velocity ratio [to vehicle velocity] near the surface and in the direction of the surface) – this tells you a lot about how the air is behaving near the surface, both in terms of rapid changes of velocity but also warns you where the air is almost stopped near the surface. Note the impact of the suspension on airflow near the body (will have the same impact away from the body). The lower picture also has simulated oil flow lines added which can be useful. The simulated oil flow uses LIC (line integral convolution) for those of you who are interested in researching the maths behind this. I really like LIC plots. 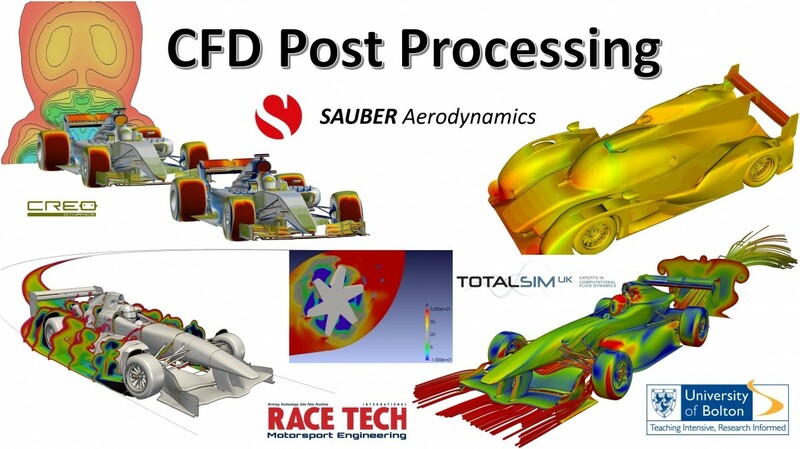 These give you ways of comparing CFD to real “oil” flow on the race car. It takes a great deal of experience and patience to learn when flow should be basically simple and almost straight, and when it can be arranged in a much more complex way. Be aware as well that gravity plays a part in the flow directions on real cars – especially if the flow visualisation liquid is still very liquid and velocities are low. These plots can also provide you with a way of getting some correlation to reality. Need to understand more? Riccardo Pagliarella suggests looking up Critical Point Theory by Chong & Perry (about 1986). I also like to see any type of plot that shows shear stresses near the surface. When searching for extremes of lift or downforce, a wing is sometimes pushed by experts to show some detached flow – typically on the trailing edge. 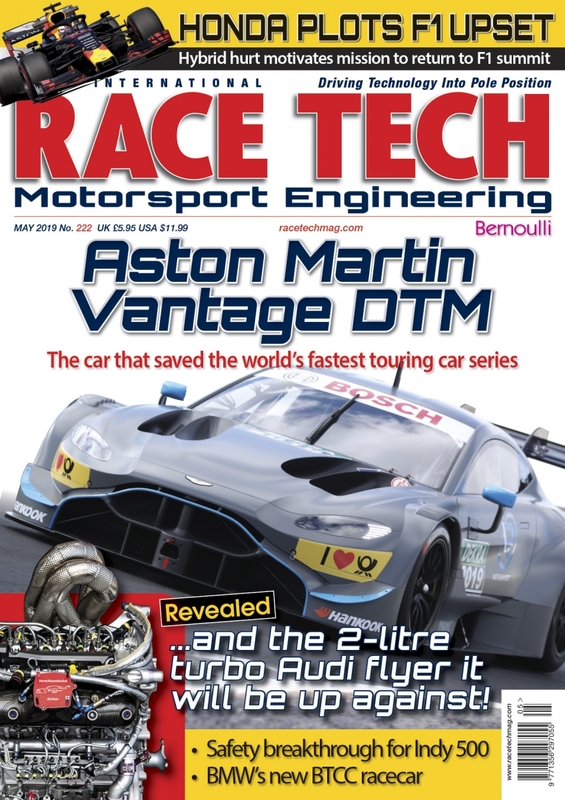 There is a price to pay in terms of efficiency but often you can get more downforce with slight trailing edge separation – especially where rules limit the number of elements that can be used. Racing cars push the limits in order to gain more grip in corners, braking and acceleration. Here is a view from below a front wing where the flow is just recirculating at the trailing edge (lower part of the picture). This is not dangerous yet, but this wing should not be pushed too much further without a redesign. The case is run in yaw so there is a difference side to side. Note, also, how much angle is achieved for the air relative to the car – for example on the front wing end plates near to the leading edge of the tyre – this is partly responsible for the wing trailing edge recirculation. Any parts operating in ground effect or influenced by pitch or yaw should not be over developed for a single condition. Check for sensitivities to attitude / height. Aerodynamicists have often described a tyre jet, caused by the fact that the air can’t pass through the tyre combined with the slowing of the air inboard of the tyre caused by the presence of the wing (expansion slows the air towards the trailing edge of the wing). These tyre jets can be damaging to the flow around the remainder of the car if not managed. 22a and 22b. Upper image shows flow (Lamda2 coloured by CpT) vorticity coming off a car (in yaw). This image has been flipped so the vortex action can also be seen on the underside of the rear wing which is shown below. The rear wing underside shows normalised UW (near surface velocity ratio – red high speed to blue low speed) and simulated oil flow (LIC) The wing has mounts below it and the case has been run at 10.6 degrees of yaw. You can see that the mount plates are causing partial triangular areas of separation. This triangular pattern is “normal” in the circumstances and actually not too awful compared to many wings on race cars today. There is also a trailing edge separation on the wing main plane. This is also not what you’d want. The strange looking flow feature on the upper part of the picture is caused by a vortex that has rolled up from the sharp trailing edge of the engine cover in this extreme yaw case. 24a. Lamda2 (mathematical way of identifying vortices – I like to see iso surfaces coloured by a useful second parameter such as total pressure) is a convenient way of getting an overview of vorticity around an object. Every created vortex takes some energy out of the airflow but vortices can be extraordinarily powerful for managing airflow when physical devices are not appropriate or legal. 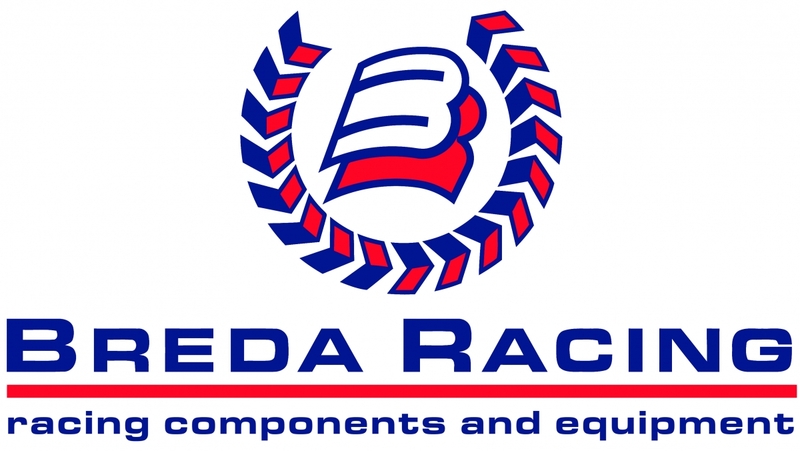 They’ve been used in F1 to great effect and in a truly extreme way. The above picture of a hillclimb car can be contrasted with flow around a generic Formula 1 car of about 2012 vintage. 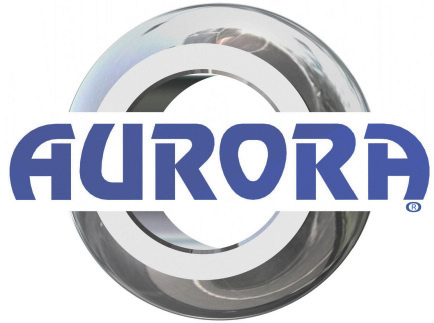 Vorticity levels on the cars of 2017 and 2018 reached dramatic levels as rules in the area beside the front of the chassis were opened up – if you ever get the chance of seeing one of these cars physically (e.g. at a show) – have a close look. We’ve had so much fun with these!!! 24b. View of Lambda2 (vorticity) around an older generic Formula one car coloured by total pressure. Great type of image for getting an overview of vorticity and energy around a vortex, more challenging to use for highly detailed analysis. This case is run at about 12 degrees of yaw. Another type of analysis I find useful is to trace flow lines. For example, where has the air come from that will cool my brakes / radiators and where does it go to? 26a. 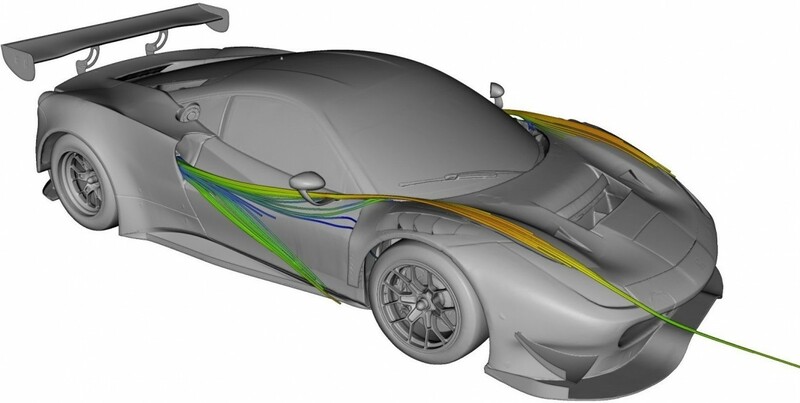 Here are flow lines showing air coming out of the main radiator of a generic GT car. I was concerned about interaction between the warm air exiting the cooler and the rear wing. Here you can see that there is “space” between the wing flow and the cooler flow. Note that most development cases are run as isothermal and incompressible so the impact of temperature (buoyancy) is not modelled. Personally I think, in this case, the impact will be small compared to the speed of the car (in the calculation), but they are things to consider. 26b. Here are flow lines entering the lower part of a rear entry duct of this generic GT car. In this case I don’t like that the source of air for the duct is split. The bottom supply will see warm air that has been near warm tyres and hot brakes. The upper supply route wraps around the mirror. Neither are ideal for getting high energy air into the rear entry.